I had a dream the other night that I was visiting my old art school in Coventry. Artists were putting on a show in the painting studios on one of the top floors of the art block. They looked engaged and thoughtful, and their art looked strong. Matt Jones was making a magnificent installation called IAMTHE. A golden room jewelled with precious stones, mirrors and lenses, with LEDs and neon flashing and occulting. 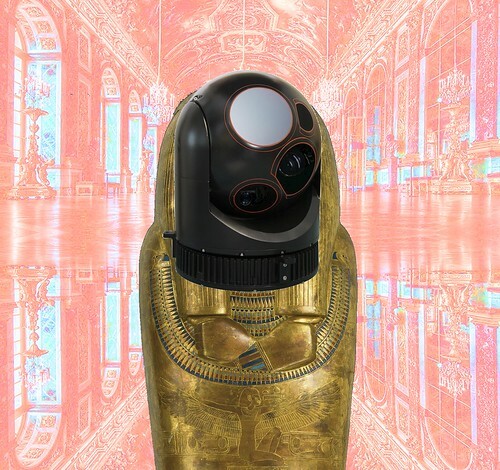 Jones planned to display himself at the rear of the room inside a gold sarcophogeal suit, its massive encasing engraved with encrypted marks and barnacled with sensors and projectors emitting fields of lidar, laser, electro-magnetism, radio and light. He would be surrounded by symbols of confidence, success and good luck. It looked like an attack submarine's control room in the Palace of Versailles. Jack Schulze was organising the show. He was striding around with two small shapes cocooned on his chest and back, giving instructions by pointing at people and wolf-glaring, always in silence because he didn't want to wake up the small shapes. He clicked his fingers at me and with a backhand indicated a corner space, the only empty one I'd seen - he wanted me to exhibit. My immediate thought was to show an Overfinch-customised Range Rover Autobiography 5.0 GT with the piano wood steering wheel*. There would be a length of green garden hose piping its exhaust into a smoke-hazed interior, and behind the wheel would sit a screaming hedge fund manager, a heavy-handed reference to the popes of Bacon and Velazquez and Hirst's shark. But the Range Rover would not have fit into the building's lift, so plan B was two, smaller pieces. On the floor, there would be a metal sphere the size of a head, made of the compressed layers of aluminium tin foil used to wrap my morning toast for the last five years. And on the wall I would install a telephone handset, in which could be heard my dead mother's voice. I'd recently learned that because she'd never had a mobile phone and had always used those handsets which were powered solely by the landline phone network itself, BT's operators had been able to capture and channel the echoes of her conversations that still vibrated up and down the network. When I heard her ghost whisper in the receiver I said "I miss you", and woke up. * I have embellished this dream, but only a tiny bit. The Jones IAMTHE image collaged from these sources: 1, 2, 3.